If you’ve had any interest in the Winnipeg Humane Society for more than the past two decades you may not have met Harriet Lyons, but chances are you’ve seen her work. 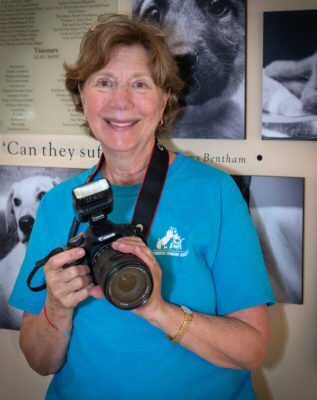 For 21 years Harriet has been a volunteer with the WHS, and most of that time has been spent as the animal photographer. Her pictures originally appeared in the Winnipeg Free Press. Now, with the growth of social media, her pictures appear online as well as on Facebook and Twitter. She’s quick to note that a lot has changed since the early days of photo shoots. Initially, they’d borrow the WHS camera (which was not state-of-the-art, as one might expect from a non-profit organization) and get some film. Pictures were taken and then the film was dropped off at Wal-Mart for developing. “Then we’d hand off the pictures to the Free Press and they would choose the ones to go in the paper to show off some of the available animals,” she said. Nowadays, digital cameras let you take dozens of pictures from which you choose the right one. With its many indoor and outdoor photo locations and natural lighting the Hurst Way location is more conducive for both animal care and photography, she added. Harriet and Adele use several ‘unconventional’ techniques to get the animals relaxed – or at least get their attention. “We often sing to the animals,” said Adele. “The cats are more responsive than the dogs. If a cat seems nervous, singing to it often calms it down. Often we’ll burst into some old song that pertains to the animal’s name. Over the years she’s photographed thousands of animals with the help of numerous wonderful handlers. They were mostly dogs or cats, some gorgeous tropical birds, rabbits (whose character is hard to capture in a photo, both Harriet and Adele confess), hairless rats (not her favourite), at least one ferret and a degu. A self-taught photographer, Harriet describes herself as a family historian who likes taking pictures but not necessarily being in them. She wants to keep doing this as long as she can, but admits that family (including five grand kids and two dogs aged 15 and two) can take up a lot of time. She’s often asked by friends why she does this volunteering. “Isn’t this a difficult thing for you to do, to be there and see these animal without homes?’ they ask. “I tell them if I can be there and get the right shot, the innocence of that kitten or pup or capture the story of an older dog or cat in their eyes, that’s what I’m here for. It’s worth every heartbreak that I feel. If I get the right picture then someone who is looking at the Internet and looking for an older animal or a pup or kitten. They’re going to see that picture and say ‘Let’s go see that dog. That dog needs us and our forever home.’ That’s why I do it.